Toxics Link, in collaboration with India International Centre (IIC), invites all to a Public Lecture on “Delhi’s dying trees?” at India International Centre (IIC), Lodhi Road, New Delhi. Delhi has transformed from being the green capital to being a concrete jungle in less than decade. In a short time, tens of thousands of trees have been chopped down for roads, flyovers, the Metro, the Commonwealth Games, and new constructions. Those remaining have been imprisoned in concrete pavements, or their branches chopped off so brutally that they are now stark looking and stump like. From the early days since nineties, when the Ridge Forest came to be legally protected and the unique Delhi Tree Act enacted, it has only been a steady decline. In fact even in many protected areas, the state of trees is dismal. Despite the existence of the Tree Authority, the various Annual Greening Plans and many nurseries and horticulture departments, it seems that Delhi will soon be a merely treeless landscape, a far cry from the shady city, replete with birds and their calls and the trees which gloriously bloomed at different times of the year. On one hand, India’s State of Forest Report 2011, brought out by the Union Ministry of Environment and Forests, claims that Delhi’s green cover (which includes shrubs and trees outside forests) doubled in a decade—from 151 sq. km in 2001 to 296.2 sq. km in 2011. This has to be a myth. In fact Forest Department have conceded that they have allowed felling of thousands of trees for the third phase of Delhi Metro’s expansion, work for which started in November 2011, with no place to carry out the 10:1 re-plantation as is legally required. Also, detailed field surveys show that most of the Delhi roads have limited surface soil for the trees to grow. 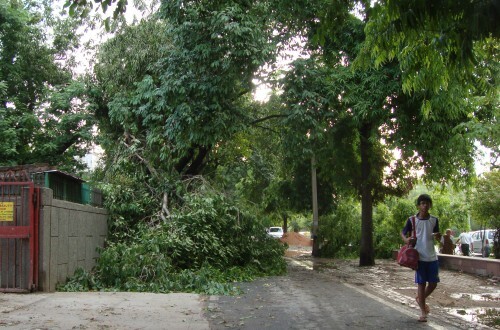 Is there any hope for Delhi’s trees? What needs to be done? A panel of very engaged citizens and those in charge of the trees will discuss this in detail. The discussion will be preceded by a short film. Film: “Last Words of a Dying Tree” is by Avinash Kumar Singh & Geetha Singh, Turtle on a Hammock Films; Duration: 5 Minutes.